Goat anti Bovine, Canine, Human, Mouse, Porcine, Rat Insulin-like growth factor II / IGF2. Product is tested for Paraffin Sections, Enzyme Immunoassay. Peptide with sequence from the internal region of the protein sequence according to NP_000603.1; NP_001121070.1. 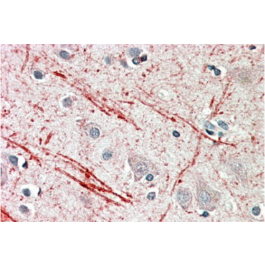 Immunohistochemistry on Paraffin Sections: 5-10 µg/ml. 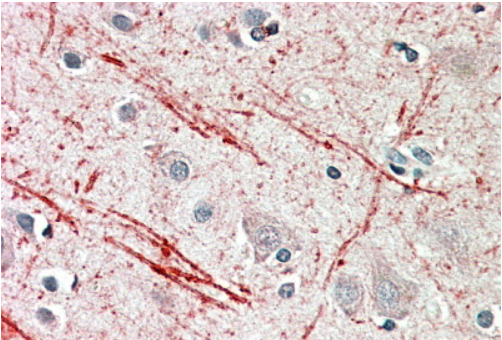 In paraffin embedded Human Cerebellum shows axonal staining. Mouse, Rat, Dog, Pig, Cow. This antibody is expected to recognize both reported isoforms (NP_000603.1; NP_001121070.1). Reported variants represent identical protein: NP_000603.1, NP_001007140.2.